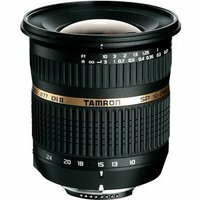 The Tamron AF SP 10-24mm f3.5-4.5 Di II LD Aspherical Sony Fit Lens (IF) features an huge 2.4x zoom ratio, unprecedented in its class of ultra wide-angle zoom lenses. The innovative, high-performance ultra wide-angle zoom lens is designed exclusively for SLRs with APS-C sized image sensors. The SP AF 10-24mm Di II from Tamron is the first-ever ultra wide-angle lens for digital SLR cameras and features a focal length range with the 35mm equivalent of 16mm ultra wide-angle to 37mm semi-wide-angle in a user-friendly lightweight, compact design. This Tamron lens is so versatile that photographers can use it to be super creative, capture fantastic views or extraordinary close-ups, bold compositions and unique perspectives.